Our heavy duty dunnage racks are constructed from 6061-T6 rust free wrought aluminum alloy. 6061-T6 wrought aluminum is a high-grade alloy with yield strength of about 35,000 pounds per square inch. For comparison, this is much stronger than “mild steel” which has yield strength at about 20,000 to 30,000 pounds per square inch. 6061-T6 wrought aluminum is used for the purpose of durability and resiliency, providing a quality that won’t easily dent, won’t rust, and can be used in any storage environment. 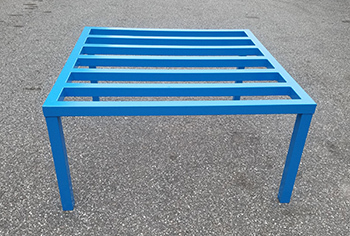 Most aluminum dunnage rack manufacturers use 6063 aluminum, which is a weaker grade of aluminum and does not have the yield or resilience of 6061-T6. Other manufacturers use this cheaper grade because they fail to see past the importance of the additional resiliency that is needed for storage to survive the daily abuses. A key test for storage racks are their resilience. Racks should be able to absorb pressure and then return to its original shape. To resist snapping, 6061-T6 alloy has a high level of pliability, much like an airplane wing. When pressure is exerted on the material it yields to the pressure, and when the pressure is released it regains its original form. The resilience combined with the extreme strength of this material makes it far superior to other racks. Located in Odessa, FL, our staff has been welding aluminum for over 10 years. 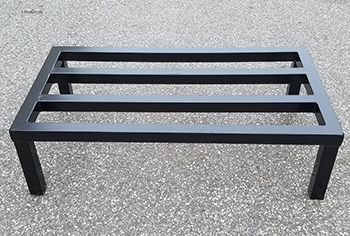 Each heavy duty dunnage rack is custom made to your specifications by American welders. 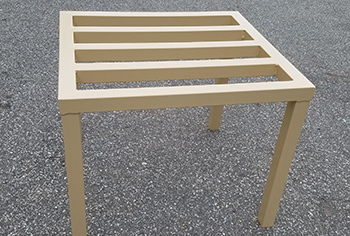 Constructing our racks in the United States gives us upmost control over quality standards and also allows us to produce these racks custom per order, something you will not find through any other dunnage rack supplier.